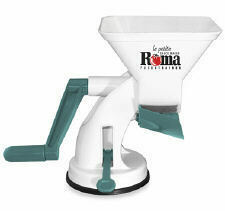 This Roma La Petite Food Strainer & Sauce Maker quickly & easily purees fruits and vegetables for your favorite recipes. You can process up to two-pounds of tomatoes per minute. Simply turn the handle and the peels separate from the puree.